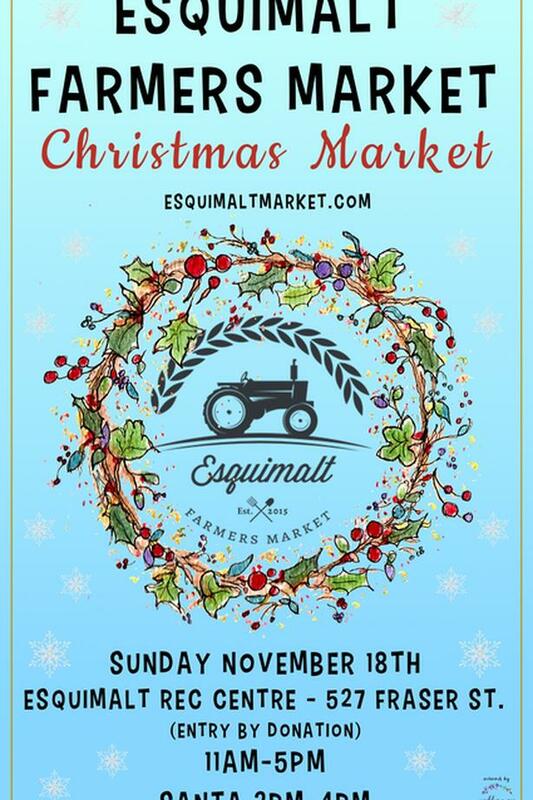 EFM's fourth annual Christmas Market is back on Sunday November 18 from 11-5pm inside the Esquimalt Rec Centre! Santa will be there from 2-4 with a professional photographer. Find locally grown produce, live music, artisans, a food truck, locally made foods and a buzzing community hub! Full vendor lineups will be posted on the FB page and our website, www.esquimaltmarket.com . Shoppers will find a wide selection of freshly harvested seasonal fruits and vegetables, ethically raised meat, chicken and duck eggs, fresh baked breads and other baked goods, a variety of prepared foods, preserves and beverages, vegan foods, local beer, wine, cider and spirit, and a range of handmade artisan items, including clothing, body products, jewellery and art! There will 60+ Vendors including a food truck (Greek On The Street) several local Farmers and a whole bunch of insanely talented artisan food producers and artists! See you there! Bring reusable bags, dinnerware from home and a cloth napkin and cash of course!! Don't forget to invite your friends, or share this event! Esquimalt Farmers Market Society respectfully acknowledges that we are operating within the traditional territorial lands of the Songhees and Esquimalt First Nations.